Our Editor Alastair Tancred describes his day at the Christians in Media annual conference. The wonderfully well-lit and spacious venue of St Mary’s in London – a church which justifiably prides itself in being free of religion but not Christianity– was the space for this year’s conference. It was an eventful day from the outset. Arriving guests and delegates received a comprehensive welcome pack which included news that we have been re-Christened with a new and much more appropriate name – Christians in Media. No sooner had we digested this – along with the delicious biscuits that accompanied our morning coffee – than our ultra-capable Mistress of Ceremonies brought proceedings to a start. Author Vicky Walker kept us on track and on time throughout the day. Theme: Broadcaster and author June cogently discussed this year’s conference theme – change, diversity and minority voices. Alastair’s comments: June had a wonderfully gentle way of expressing herself. She described her struggle to break into broadcast journalism with no self-pity even though she had to overcome seemingly insuperable obstacles to break into what was then – and some would argue still is – an overwhelmingly male and pale industry. She also movingly described how she overcame her own doubts – and those of her family – about her career choice. She said those reservations were so strong she even had a name for them – “impostor syndrome”. Theme: There are thousands of people in our cities who are unaware that God has a better plan for them. We can make sure they are better informed by using the tools at our disposal more effectively to communicate with them. [When using social media as a means of communication]: What is the message you are trying to convey? Who does it need to reach? Where can you find them? When is it best to say it? Alastair’s comments: Mark is a master of his trade who obviously has a heart to reach out to the poor and dispossessed. In Jesus’ time we were encouraged to proclaim our message from the rooftops, but today we have to think how the same objective can be achieved through well-devised media strategies and social media. Panel Discussion: What Does God Look Like On TV? Theme: With the BBC announcing a “Year of Beliefs” in 2019 comprising specialist programming and documentaries about faith and religion, the panel discussed how this would affect the representation of faith in the mainstream media. 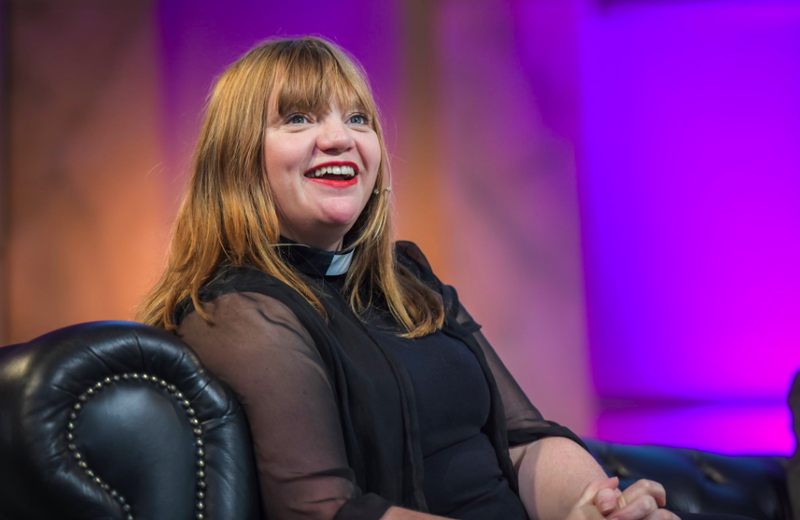 Participants in the debate chaired by the Rev Kate Bottley included Songs of Praise Producer Mark Warburton, ‘More Tea Vicar? Author the Rev Bryony Taylor and BBC Project Director Mark Friend. Memorable quotes: Mark Friend stressed that broadcasters must strive to appeal to a wider group of people when it comes to faith issues “a broader audience” was needed to be attracted by “new creativity”. Bryony Taylor argued that it was good that faith issues were cropping up more in everyday TV – including numerous dramas that had featured vicars in various guises – because there was a level of public indifference and ignorance about Christianity. She described wearing a dog collar in a supermarket queue and being asked by the checkout woman how long she had been a nun. Mark Warburton said that some people watch Songs of Praise – which often has a bigger audience than the total number of people who go to church – on Sundays before they themselves going to church. “But I prefer people who do not go to church [to watch the programme] than those who do.” He said that social media and digital are playing a key role – if you can do social media well, you can experiment with new kinds of content. Alastair’s comments: The three expert panelists were in a way all singing from the same hymn sheet. Faith broadcasting is a challenge in the 21st century and no one should be under any illusions as to how hard it is to retain and attract new audiences. The fate of the BBC’s Something Understood programme is testament to that. Theme: Our panel of experts explored what next year will bring for new technology in the media in a discussion chaired by Christians in Media’s James Poulter. 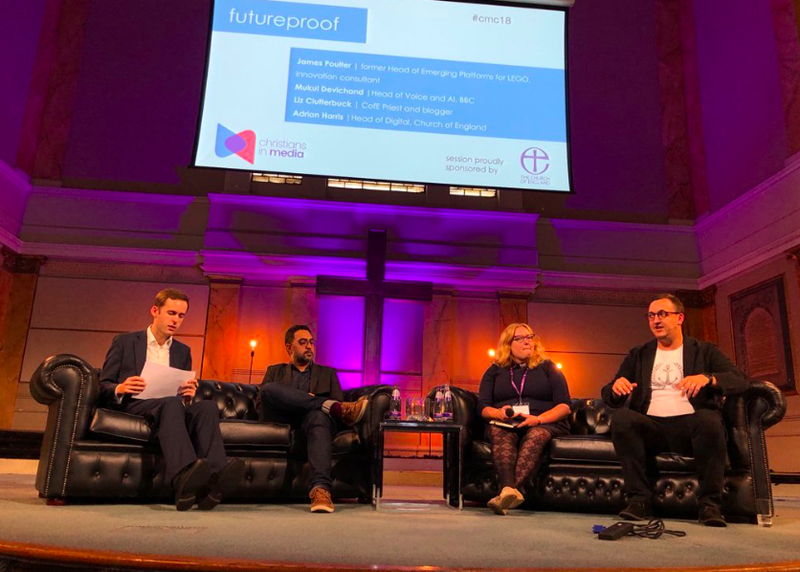 Those on the stage were the Church of England’s digital supremo Adrian Harris, the Rev Liz Clutterbuck and the BBC’s head of Voice Mukul Dewichand. Memorable quotes: Adrian Harris pointed out that the Church of England has now gone truly digital, and new technology was the bedrock of its evangelism, discipleship and common good campaigns. He said a key objective now is to reach out to irregular church goers through new technology, pointing out that 40 percent of households in the UK next year will own a smart speaker. He said there now tremendous opportunities “to use digital [technology] to bring people into a relationship with God”. Liz Clutterbuck said that a key decision recently was the decision by the Church of England to launch a Common Prayer daily worship app. She said this was so significant because it makes accessible something that previously “was only available in a lonely church”. Now anyone who wants to can have access to daily prayer, with the Alexa speaker even on hand to say The Lord’s Prayer or Grace ahead of meals. But she cautioned that “Alexa cannot administer Holy Communion, because the sacraments cannot be downloaded to a device”. Mukul Devichand said that the BBC was testing a number of different types of new technology, especially in relation to smart speakers and the kind of ways they can respond to the queries of children. He said that the future lies in algorithmic and personalised content. He said that we in the media are now entering an era where things are getting much more sophisticated. But we are still awaiting what he described as as “a killer app in voice” that will dominate the market. Alastair’s comments: Adrian Harris could not have put it more eloquently. Christianity is never more relevant than it is today and if we are to proclaim our faith successfully we must use devices like Alexa and other forms of Artificial Intelligence to bring people into our community. Theme: In an hour Susie went through a beginners’ guide to taking better video – either with an iPhone or with a more sophisticated camera. Alastair’s comments: It’s no easy task teaching people the basics of film-making in an hour – the BBC take several days to do it. But Suzie made an exceptional effort, skilfully reminding her audience that before they even start they must figure out what is the purpose of their film, who is it for, how long should it be, what is the desired outcome and best approach? Panel Discussion: Glass Ceilings And Pay Gaps - What Changed And What Still Needs To Change For Women In Media? Theme: An assessment into what challenges women in the media have faced and what obstacles still confront them in 2019. The panel was chaired by WTalk founder Tobi Olujinmi and comprised the Rev Sally Hitchiner, The Telegraph’s Lucy Denyer, Prof Tina Beattie and journalist Tobi Credein. Tobi Oredein pointed out that we live in a “Kardashian era” where traditional ideas of married people being loyal, romantic and intimate with another are fast becoming outdated. She called for positive discrimination to assist people of colour in the workplace. Lucy Denyer – a mother of three - pointed out that a key reason for the gender pay gap related to women who lose out because of child bearing. But she said things were changing, and that in 10 years’ time young mothers would find the work place to be more accommodating than it is now. Alastair’s comments: It was sobering for me as a middle aged, middle class white man to hear of the struggles these admirable women have overcome to get to where they are today. We men have not made it particularly easy for women of any background or class to work in the media, yet at no point did this formidably talented panel remind us that we should repent for past misdeeds. Theme: Susie’s documentary The Wait follows the lives of Syrian Christians who escaped oppression in their homeland to take refuge in Lebanon. Alastair’s comments: Susie’s film superbly captures the tension among the refugees as they nervously wait to find out if their visa applications to seek a new life abroad have been accepted. We loved seeing you at this year’s conference, and we’d love to hear your thoughts on our sessions in the comments below!